Basiliscus was a member of the east Roman aristocracy during a period of bitter struggle between the Roman Empire and a number of ‘barbarian’ groups. One of these groups were the Isaurians, a fierce mountain-dwelling people from south-central Anatolia (which is a big chunk of what is now Turkey) who retained some degree of independence at least until the time of Justinian. From emperor Leo I's perspective, Isaurian recruits strengthened the imperial army against invasion and provided a much-needed counterbalance to the power of Aspar, the Alan magister militum (master of soldiers). Leo I (457-474) AV Solidus (20 mm, 4.46 g), Constantinople, c. 462-466 AD. Obv: D N LEO PERPET AVC, helmeted and cuirassed bust facing slightly right, holding spear and shield. Rev: VICTORIA AVCCC Δ, Victory standing left, holding long cross; to right, star; CONOB in exergue. RIC 605. The rise of the Isaurians within the imperial court ultimately led to one of them, Zeno, marrying Leo I's daughter Ariadne. Zeno had adopted his Greek name so as to be more acceptable to the populace, but it seems the aristocracy, at least, never forgot he was really "Tarasikodissa Rousombladadiotes" (say that 5 times fast). When Leo I died, Zeno and Ariadne’s son – 7 year old Leo II – succeeded the throne. Eyebrows were definitely raised when ‘barbarian’ Zeno was elevated to co-emperor almost immediately. When Leo II died a few months later, leaving Zeno as sole emperor, the aristocracy struck: Leo I's wife, Verina, together with a court cabal raised her brother, Basiliscus, to the throne. And Zeno skulked off to one of his mountain strongholds. In the end, though, Basiliscus's military experience would be useless. During his year on the throne, he managed to alienate everyone who mattered by allowing a massacre of Isaurians, raising taxes, taking money from the church, favouring the heretical miaphysitism, and even executing his sister Verina's lover. Basiliscus had only one somewhat loyal force left in the Balkans, and they were kept busy by Theoderic and his Ostrogoths. His Isaurian commander, Illus, who had supported him against Zeno, switched sides — to support Zeno’s return. Zeno bribed Basiliscus's nephew and last remaining supporter and so was able to re-enter Constantinople unopposed. The ‘barbarian’ was back on the throne. Counterfeit coins have been around almost as long as people have been making coins. (Maybe a few minutes less?) The earliest coins were produced in Asia Minor in the 7th century BC and production of a type of counterfeit coin — a fourrée — started around the same time. The counterfeiter made a profit by making a coin that had less precious metal content than the purported face value. A fourrée has a base metal core and plated with a precious metal (usually silver) to look like its official solid precious metal counterpart. Most ancient fourrées appear to have been made by wrapping two thin pieces of silver foil around a blank copper or bronze base before striking. There would be one piece of silver foil on each side, with the two pieces overlapping around the edge. If the coin was subjected to high enough heat and struck hard enough, an alloy would be created between the foil and the base metal, fusing the layers together. Later, silver was added to the base metal coin after it had been struck, which allowed even less silver to be used. It’s not clear how counterfeiters managed this feat. Possibly the coin was dipped in molten silver, brushed with molten silver, or dusted with powdered silver and heated until the silver melted onto the surface. Similar processes could be used to plate base metal cores with gold, instead of silver. Gold foil is considerably easier to work with, so this type of fourrée presented fewer technical challenges. Over time, the plating on the higher parts of the fourreés could wear off, exposing the base metal underneath. But instead of waiting for time to expose a counterfeit, other methods were used. Since copper and bronze are less dense metals than silver and gold, fourrées are almost always underweight. In ancient and medieval times, as well as being weighed, coins were also often cut into in order to check whether they were plated or solid. In a typical Greek city, official testers sat near the banking tables in the agora (market centre) to cut into the coins to test them for authenticity. The judgement of an official tester — a dokimastes — was final and coins that were silver and the correct weight had to be accepted in commerce, whether they were minted in that agora's city or not. 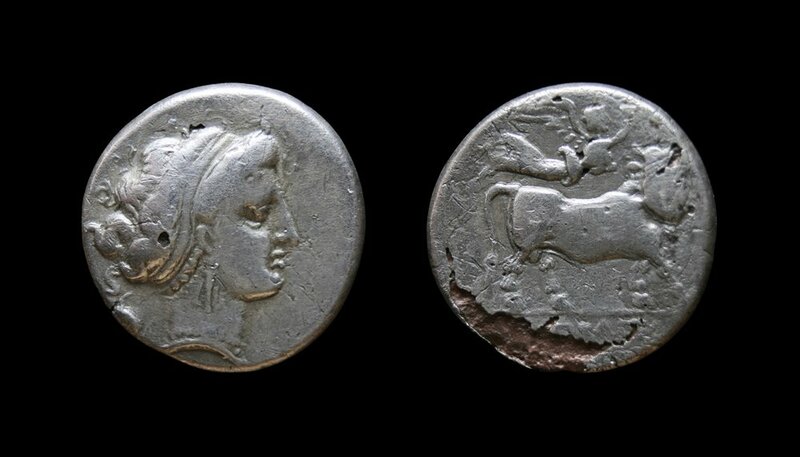 In Athens, counterfeits were were slashed by the dokimastes, removed from circulation, and dedicated to the Mother of the Gods (Rhea, later associated with the Asian Cybele). Fourrées have been found near the Metroön, a temple dedicated to her, and today it is easy to find Athenian tetradrachms with test cuts. Struck on the Phokaic weight standard, these early lumps of metal probably come from somewhere in northern Ionia when coins were still a novelty. 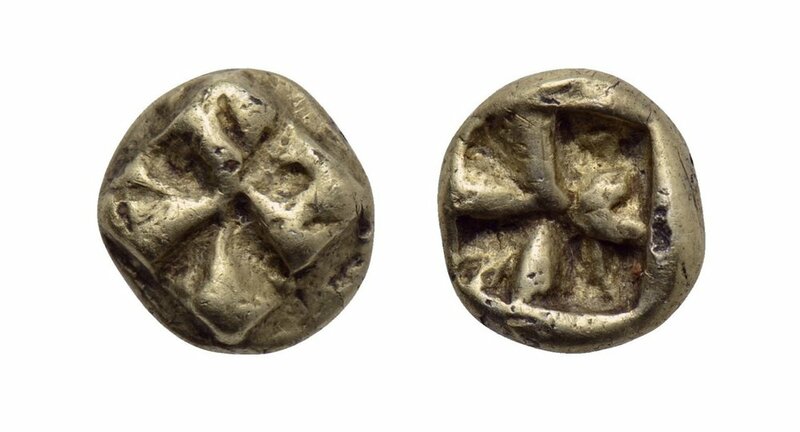 However, there was clearly enough standardization and trust that counterfeiting had a chance of success... even for a counterfeit that was underweight, like the first coin above (a hemihekte), which should really be half the weight of the second (a hekte). Testimony to both the good and bad sides of human ingenuity! It is easy to see the copper inside this fourrée. It is also significantly underweight, about 3/4 of a gram below the norm for a genuine mint product. It is nevertheless very collectible as an ancient counterfeit! Fourrée denarii from the Republic are quite common. This example is very underweight (by over a gram), in part because a significant portion of the base metal core has corroded away leaving just the silver shell on one side (you can easily see the hole through the coin on the right hand side of the reverse). The small dot in front of Roma’s nose on the obverse may have been placed there by the counterfeiter so that he wouldn’t get fooled by his own (very convincing) work! After 260 under Gallienus, there was so little silver that counterfeiting would have been pointless and impossible. This coin comes from the joint reign of Valerian and Gallienus, and was produced in 256 at the earliest (the coin is actually a “mule” of an obverse and reverse type that was never produced officially). 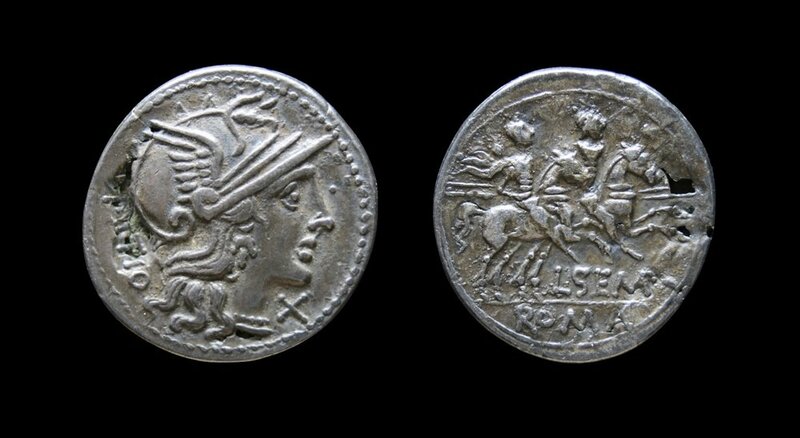 At this time the official antoniniani would have been composed of maybe 15-20% silver – they were basically fourrées already! Plated counterfeits may have been barely profitable if skillfully made with a very thin foil, but one would expect them to be rare. Here is an example of a gold fourrée where much of the gold foil has worn off. It would have been convincing at the time of its manufacture, except for being underweight by 1.5g. (It would have been very difficult to pass off except perhaps in a bag of otherwise good gold, weighed in bulk.) Now it is about as ugly as they get! But even ugly coins deserve some love.